I think I've had pumpkin puree in my fridge non-stop for almost two months now and I refuse to throw any of it out. It's become a staple in there and I have vowed to use every last bit of it. Yesterday morning, I asked my son if he wanted french toast for breakfast and, well, he didn't. I did. So I opened the fridge to grab the eggs and that pumpkin puree was staring at me. It was like it was saying "Mix me with those eggs." 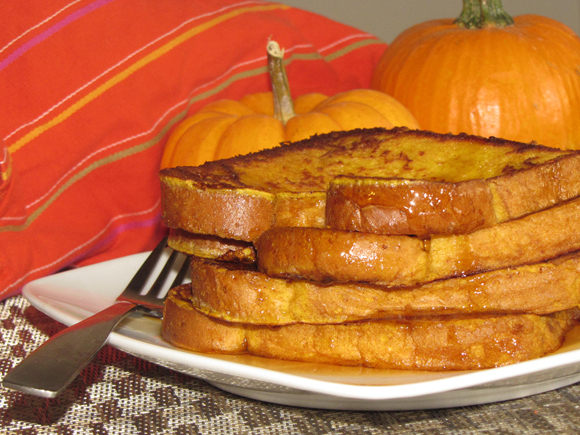 For some reason it had a really high voice... Anyways, the pumpkin french toast was born in the blink of an eye and it was sooooo good. My husband is getting pretty tired of pumpkin-flavored anything around here, but he was a trooper and tasted it for me. Seal of approval. Yay. So now I share this scrumptious recipe with you and hope that one day you will try it. If not for yourself, do it for the love of pumpkins everywhere. Your tummy with thank you. 1. 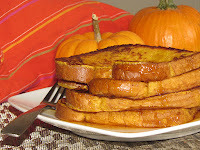 In a wide, shallow bowl, whisk together eggs, milk, pumpkin, pie spice, brown sugar, vanilla extract and salt. 2. Melt a little butter in a large non-stick skillet (or spray with some non-stick spray) over medium heat. 3. Dip each piece of bread in the egg mixture letting excess drip off. Cook for about 2 minutes per side until golden brown. If you're doing multiple batches, add a little butter/spray to the pan before each new batch. 4. Serve with your desired toppings.